Turn a simple toy motor to become a generator which converts hand motion to electric energy and powers a light bulb. No battery, no pollution, just amazement. The generator could be used as an awesome emergency torch. Cautions: High Voltage of Inspiration and Fun! 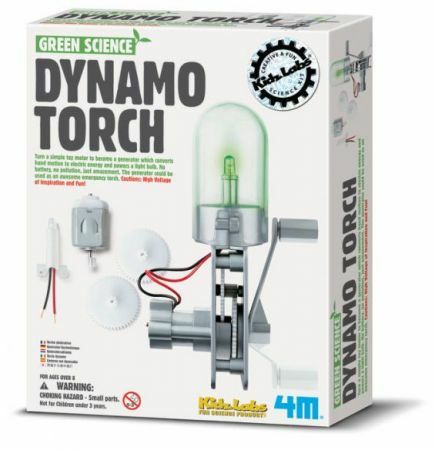 Contents: 1 LED lamp with holder and wires connected, 1 toy motor, 2 gears, 1 set dynamo torch casing accessories (assembly required), 1 transparent torch cover, screws, detailed assembly instructions with fun facts. (Pocket screw driver for cross head screws required from home.) Torch size at 12cm in height.